Destruction are a German thrash metal band formed in L?rrach, Germany in 1982. They are considered one of the "three kings" of the Teutonic thrash metal scene; the others being Kreator and Sodom. They were first known as Knight Of Demon with the original line-up being vocalist and bassist Marcel "Schmier" Schirmer, drummer Tommy Sandmann, and guitarist Mike Sifinger. 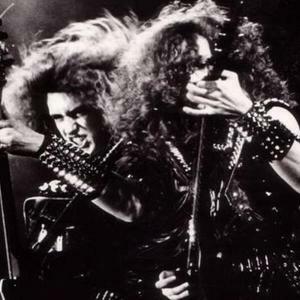 They changed their name to Destruction in 1984 and released a demo titled "Bestial Invasion of Hell". After this, the group signed with Steamhammer Records and released an EP titled "Sentence Of Death" later that year. Destruction released their first full-length album titled "Infernal Overkill" in 1985, followed by "Eternal Devastation" in 1986. The trio then added a second guitarist, Harry Wilkens and released the EP "Mad Butcher in 1987, followed by the full length album "Release from Agony" in 1988, then a live recording "Live Without Sense" in 1989 and "Cracked Brain" in 1990. In 1989, Schmier was asked to leave the band due to creative differences and the group underwent a period of commercial deterioration. During the grunge explosion during the early to mid 1990s, the band lost their record label support and had to self-release and produce their own albums. The result was two EPs called "Destruction" in 1994 and "Them Not Me" in 1995 along with their only 1990's release called "The Least Successful Human Cannonball" in 1998. In 1999, Schmier rejoined and things began to look up for the band as they signed a record deal with Nuclear Blast. They then released three more albums; "All Hell Breaks Loose" in 2000, "The Antichrist" in 2001, and "Metal Discharge" in 2003. The band would then sign with AFM Records and release "Inventor of Evil" in 2005. The band's next album, "D.E.V.O.L.U.T.I.O.N. ", was released in August 2008. In early 2009 Destruction is scheduled to tour around North America. Currently, the band is in the studio recording their new upcoming album called "Day Of Reckoning" which is due for release in January 2011 via Nuclear Blast records. The first statements from the band are promising a more fast and turbulent album than the 2008 studio record "D.E.V.O.L.U.T.I.O.N.". T?gtgren appeared with Schmier on the track "Total Desaster 2000" from the "All Hell Breaks Loose" album. All of these artists, with Schmier, were featured on the same song, 2005's "The Alliance of Hellhoundz", from the "Inventor of Evil" album. All of these artists, with Schmier, appeared at the Wacken Open-Air Festival in 2007 on the track "The Alliance of Hellhoundz", recorded for the 2009 live album "The Curse of The Antichrist: Live In Agony". Evile guitarist, he played the Caos Emergent Festival in Portugal on September 13, as a replacement for Mike Sifringer who broke two fingers in Belgium at the Vlamrock Festival on August 29. Then went on to play as Destruction's second guitarist as a guest onstage at Damnation Festival.